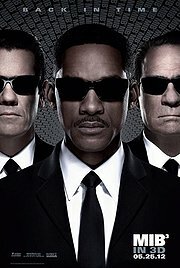 How should I approach Men in Black 3…a film in which it’s last film came out nearly a decade ago? We could discuss some of the supposed motivations according to it’s film creators/creative team about how the time travel idea was discussed since the end of the last film or the focus could be on the fact that the film had to be rewritten midway through the shoot and halting production for nearly six weeks. But in my opinion, the big issue that ran through my mind while watching the film was – did it prove itself to be necessary in the franchise? The end answer is that it unfortunately doesn’t completely make its case well with a fairly lackluster build-up that hinges too much on the familiar and doesn’t have a great selling point, but the second half and some nice touches make it at least worthwhile watch for fans of the series or anyone in the mood for a random sci-fi comedy. Men in Black 3 comes back to Agent K (Tommy Lee Jones) and J (Will Smith) who are still working for the Men in Black and keeping Earth safe from evil alien forces. However, Boris the Animal (Jemaine Clement) recently escaped from his prison on the moon and is out to kill Agent K for blowing off his arm decades earlier. To do this, Boris travels back in time. When J wakes up one day and finds that K has disappeared and is stated as deceased, he must go back in time, meet a much younger K (Josh Brolin) and try to set time right. Men in Black 3 starts off as a film that plays it a bit too safe by feeling reeled back both in terms of it’s visuals, it’s plot structure and even it’s humor. Director Sonnenfeld and his crew do their best to really create this feeling of continuity between the first two films and this one in terms of the atmosphere and setting, which at first, may seem like a pretty simple and expected task. However, along with these set pieces that were supposed to be nostalgic, little has changed other than a new villain, a small shake-up in the concept and a few new characters and scenarios. The formula of the film feels predictable with the plot beats being too familiar and easy-to-follow. Even the newer elements that are constantly touted in the film as being shocking end up feeling more innocuous than it really does and bleeds into the best part of the film, it’s ending, which after much musing, feels forced and robotic (both the emotional and action endings). This lack of effort comes over into the visuals and humor as well – the CG feels like a weak point, with the exception of a scene in Cape Canaveral, and the humor, especially in it’s first half, feels rough and stuck back in time (no pun intended). So even after all these complaints, is there much left about the film? Luckily enough, there are some redeeming moments that play enough and especially for the fans. One strong element is that the actors are still endearing enough from both the older to the newer entry of characters. (Mostly) Gone are the gimmicky, slapstick or one-note characters and instead, effort is put int building up some of the central characters. Smith’s endearing and gung-ho attitude is still fun to watch and plays well off of the pretty pitch-perfect Brolin who doesn’t bat much of an eye as he plays a great interpretation of Agent K/Lee Jones’ character. It’s a gag that may not stay funny throughout the film but emotionally, the connection is there. Personally, I found a character introduced midway through (with has some obvious deux ex machina mechanics at his disposal) to be one of the most endearing characters of all. For fans, there are tons of nods and winks to the older entries that should keep them pleased throughout the film along with some fun cameos along the way to try to keep audiences guessing at who else is included. And even the weaker humor in the first half is supplanted with some better gags and past observations that are played fairly well. Finally, perhaps most importantly, there is at least an attempt at creating some emotional context with the audience and the characters. Even though the end implementation may feel artificial, the attempt and the proceeding will at least, superficially, feel wholesome and is at least appreciated in a summer film that could have simply tried to be completely cool. Men in Black 3 is a strange sight to see – being taken out of retirement (and by the looks of things, most likely being put right back) for an entry that doesn’t completely sell itself as being necessary but still should be enough for fans to enjoy. The film does have it’s moments such as a great performance from Brolin, some good nods back to the other films, and a relatively strong ending. However, time has not been so kind to the series and much of it’s humor is relatively ho-hum and a standard narrative that feels too familiar than nostalgic along with relative problems with it’s CG and editing. Even the ending feels a bit shoehorned. All-in-all, series fans should enjoy it and as an enjoyable rental, Men in Black 3 is innocuous, but was it all that necessary to bring back and explore? At least in this film’s case, even jumping back in time proved for naught.